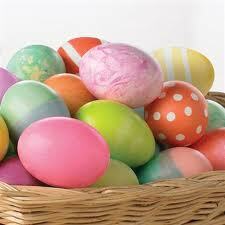 Easter is a Christian holiday that like most is mixed with ‘pagan’ ritual and celebration. Pagan rituals were adapted around important Christian celebrations. Even the word Easter comes from the Anglo-Saxon goddess of spring, “Eostre.” Today, Christians celebrate the Resurrection of Jesus Christ on Easter, but most Americans also celebrate the spirit of spring and renewal. The holiday also has its roots around the Hebrew time of Passover, which dates back to Moses leading the Jews out of Egypt. The egg has long been a symbol of new life and fertility that we associate with springtime. The Easter bunny, same thing…fertility. On Easter, some families gather to hunt eggs and eat candy left by the Easter Bunny, some go to church, and some just take the day to be together. What traditions do you celebrate?